October is here and it is eczema awareness month! 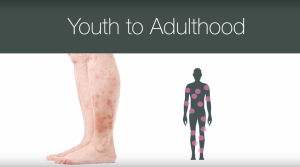 Eczema is a common skin condition that affects 10-20% of the US population- both adults and children. Eczema is aka atopic dermatitis and is part of the atopic triad, which also includes asthma and hayfever. Individuals with eczema have a different immune system and sensitive skin that can break out into eczematous rashy flares when the skin gets too dry or irritated. There are different organizations out there that help support those individuals with eczema. One of them is the National Eczema Association. “The National Eczema Association (NEA) is a non-profit organization… with a mission to improve health and quality of life for individuals with eczema through research, support, and education.” The NEA is also guided by a Scientific Advisory Committee comprised of volunteering physicians, dermatologists, and scientists who have expertise in eczema. Dr. Amy and the Baby Pibu team want to give the NEA a shout out so that our parents whose children or themselves struggle with eczema can rely on a resource that can further support them. Here is one reason why Dr. Amy and the Baby Pibu team support the NEA. The NEA recognizes products that may help people with eczema-prone skin. The NEA recognizes these products through its Seal of Acceptance (SOA) program. 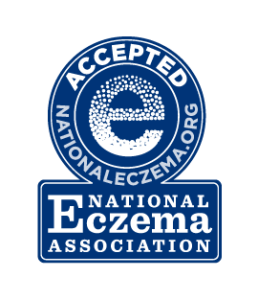 The SOA criteria must be met in order for the product to carry the National Eczema Association Seal of Acceptance on its label. One criteria that must be met is that the product does not contain ingredients that should be avoided in people with eczema-prone skin or sensitive skin. Please note- the NEA’s SOA is not an endorsement by the NEA. Product categories of the NEA’s SOA include moisturizers, cleansers, clothing and fabrics, hair care products, disposable wipes, household products, OTC drugs, and sunscreens. Included in the National Eczema Association’s Seal of Acceptance moisturizer category areBaby Pibu’s Baby Butter and Baby Pibu’s Hydrating Ointment.Baby Pibu’s 2-in-1 Bathtime Wash is included in the cleanser category. Recognized in the household products category is All Free and Clear laundry detergent. 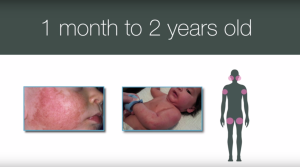 If you or your child has eczema and want to learn more about eczema, please visit nationaleczema.org to learn more this common skin condition and to learn how to receive more educational and well-being support.